When Gov. Mary Fallin and Lt. Gov. Todd Lamb go see their primary-care doctors, they pay $30 out of pocket. Their prescriptions cost $10 if they get generics, more if they get name-brand drugs. Oklahoma taxpayers pick up the entire cost of their insurance premiums, which total $18,113 per year for each of their families. In fact, the health allowance they receive from the state totals $19,717 a year. They can use the surplus to pay for other state benefits or roll it into their take-home pay. Fallin and Lamb are treated no better or worse than any of the 78,760 state employees and dependents who receive health insurance as part of their benefit packages. State officials acknowledge that their employee health benefits are robust. Few private or public-sector plans routinely cover the entire cost of family health-plan premiums — and then some. Oklahoma Watch reporter Warren Vieth talks to KGOU's Kurt Gwartney about the health insurance benefits provided to the state's political leaders and workers. “They have, comparatively speaking, a fairly generous benefit allowance for their health insurance,” said Frank Wilson, the state’s plan administrator. “It’s way rich,” said Rep. Jason Murphey, R-Guthrie, one of 143 state legislators who participate in the state insurance programs. Click here to see how many legislators are enrolled in each state health plan, and what each plan costs. State officials note that the generous benefit package helps offset the fact that state jobs don’t pay as much as some private-sector positions and that state employees haven’t received an across-the-board raise since 2006. Yet some advocates for the poor say it seems unfair that policymakers who oppose expanding Medicaid in Oklahoma get to participate in one of the best tax-financed insurance programs in the country. “It’s interesting that a group of policymakers that basically depend upon the taxpayers to pay the entire premium for their family are saying they’re against any kind of government subsidies for health insurance,” said Senate Democratic Leader Sean Burrage, D-Claremore, whose family is enrolled in the same plan as Fallin and Lamb. Medicaid, of course, is a federal entitlement program for the poor, while Oklahoma’s insurance coverage for state workers is an employee-provided benefit program. The question of whether to expand Medicaid involves considerations of a range of issues, including cost and public health. The cost of Fallin’s and Lamb’s coverage could be calculated because both of them provided information on their health plans requested by Oklahoma Watch. Their health benefits are in addition to annual salaries of $147,000 and $114,713. “The governor believes that state employees, like troopers, social workers and elected officials, should receive health benefits, just as she thinks they should be paid a salary,” said Alex Weintz, the governor’s press secretary. The Oklahoma Watch survey was sent to 11 statewide elected officials and 60 legislators holding leadership positions in both parties. Participants were asked whether they and their dependents participated in state-provided health insurance plans and to identify the plans they chose. Of 11 statewide elected officials, nine provided the information requested. The two who did not were Attorney General Scott Pruitt and Labor Commissioner Mark Costello. All but one of the statewide elected officials said they were enrolled in HealthChoice High, the most popular of the eight health insurance plans offered by the state and the one chosen by Fallin and Lamb. Most of them said their spouses and/or children were enrolled, too. State Superintendent of Public Education Janet Barresi chose a different plan, the HealthChoice S-Account. It is a higher-deductible, lower-premium policy designed for use with a tax-sheltered health savings account. Of the 60 legislators surveyed, seven responded. Among the top leadership, Senate President Pro Tempore Brian Bingman, R-Sapulpa, said he and his wife were enrolled in one of the HealthChoice plans, but he didn’t specify which one. Senate Democratic Leader Burrage said his family was enrolled in HealthChoice High. House Speaker T.W. Shannon, R-Lawton, and House Minority Leader Scott Inman, D-Del City, did not provide the requested information. The Office of Management and Enterprise Services, which oversees the state plans, declined to provide health coverage information about individual legislators or other state officials, citing federal law. But in response to an Open Records request submitted by Oklahoma Watch, the OMES’ human capital management division provided summary figures showing how many legislators participate in each plan. Of the 149 members of the Oklahoma Senate and House, 143 are currently enrolled, the agency said. OMES coordinates health insurance benefits for all state employees, most educators, and many local government workers, including dependents and retirees. Its plans cover 219,676 Oklahomans, or nearly 6 percent of the state’s population. State employees receive a fixed allowance on top of their salaries to cover the cost of health insurance. The amounts were determined by the Legislature and have been frozen since 2012. The current allowance is $7,273 for the employee, an additional $8,061 for his or her spouse, an additional $2,759 if one dependent child is enrolled, or an additional $4,383 if two or more children participate. For a family of four, the allowance adds up to $19,717 a year. Those figures do not include additional allowances to help cover the cost of dental, vision, disability and life insurance. Public school employees receive a different allowance, and it doesn’t cover their spouses and dependents. Local government worker allowances vary widely and are not tracked by the state. Retirees receive a small allowance determined by their pension plans. The allowances provided to state employees exceed the cost of their premiums in most of the health plans. Employees can use the surplus to help pay for other benefits, like dental or vision coverage. Any remaining balance shows up in their paycheck in the form of taxable take-home pay. State employees are allowed to opt out of the health insurance pool. If they do, they receive $1,800 a year in lieu of a health allowance. Only 218 state employees opted out this year. State officials believe that’s because the insurance program is generous. The health insurance allowances provided to state workers and their dependents cost Oklahoma taxpayers $426 million in 2012. The premiums paid by employees totaled $348 million, meaning allowances exceeded premiums by $78 million. 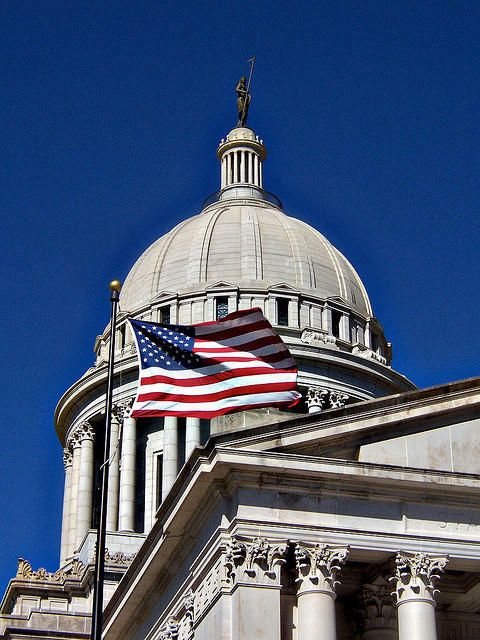 Oklahoma is one of only seven states that paid 100 percent or more of the health insurance costs of at least some state employees and their family members, according to a report issued in December by a working group headed by OMES Director Preston Doerflinger. Doerflinger’s agency recently hired a California consulting firm to conduct a study of state employee salaries and benefits to determine how they compare to those of other public and private employees. Its findings are expected in October. Employee advocates say the benefits received by state workers should be viewed in the context of total compensation. They cite a 2012 state survey that found state employees, on average, are paid 24 percent less than the competitive market rate for their jobs. When the value of benefits was included in the calculation, the shortfall was 16 percent. Some lawmakers contend the state insurance program is too generous, and does not provide adequate incentives for workers to keep their health care costs as low as possible. They want to create new incentives to expand use of health savings accounts that feature high-deductible policies, like the one Barresi chose. “The HealthChoice plan itself has always been very rich, both in benefits and in allowance,” said Murphey, the Guthrie lawmaker. Note: Oklahoma Watch reporter Warren Vieth is a part-time employee of the University of Oklahoma and is enrolled in a partially subsidized university health plan, which is separate from health plans for state employees.